It’s been 10 years since my mother lost the only house she’s ever owned. A warehouse worker in Jackson, Mississippi, one of the poorest American cities, my mother lost her house to the flood waters of Hurricane Katrina that uprooted families, killed thousands and laid waste to entire neighborhoods throughout the Gulf States. My mother earned less than $11 an hour. She didn’t have the means to fix the house after the water receded and mold spread through it like a mile-a-minute weed, so she lost the house to foreclosure. She had lived in it for only two years. On Aug. 29, it will be 10 years since the deadly storm that pushed families already living on the brink over the edge. My mom, like so many others, is still recovering. Despite the losses – Katrina was the worst residential disaster in U.S. history costing $135 billion in damage – we as a nation haven’t done much to prepare the most vulnerable of our communities for disaster. Today, I see another disaster striking low income communities. I see the devastation that the four-year drought in California is having on families already struggling to get by as it parches the land, displaces people and drives out jobs. Like Katrina, where impoverished communities such as the Lower 9th Ward in New Orleans were wiped away by the storm, in California the people hardest hit are those who live in communities that have experienced disinvestment. “The people with the fewest resources to begin with have the hardest times rebounding,” says Heather Joy Rosenberg, a US Green Building Council Ginsberg Fellow. The California drought is highlighting the differences between the haves and have-nots in the nation’s most populous state. There is a tension between water as a human right and as a commodity that has existed throughout the state’s history, but that we feel acutely during droughts. Today in California, if you can afford to pay for water, you can have lots of it. Nowhere are the stark differences more apparent than in two radically different communities south of Los Angeles. In Cowan Heights, a wealthy community, property owners who can afford their water bills have kept their lawns lush and green during the drought. Residents there consumed 572.4 gallons of water per person during the hottest months last year, from July to September. Thirty miles away in Compton, families that are in a daily struggle to make ends meet limit their water use for the basic necessities of life, including bathing and cooking. Lawns, not surprisingly, are dull and brown. Compton used 63.6 gallons of water per person during the summer last year. The state is rationing the amount of water Californians use, calling for four to 36% cuts by community. Steep rises in water rates are likely to follow. But in south Los Angeles, where I work and a third of the residents live in extreme poverty, residents can’t afford high water bills. They are like many American households in the bottom 40% of incomes, which spend about 15% of their average $18,000 a year incomes on utilities. For decades, the people in these communities have lived figuratively with drought, from a lack of green space and trees to food deserts. Now they face a literal drought if they cannot pay for water. We must begin to think smartly about how to prepare vulnerable communities for the effects of climate change so they can sustain themselves. For example, we should plant more trees in communities where parks are scarce to keep neighborhoods cooler as temperatures rise. Then under those open spaces, we can construct aquifers to capture storm water. In Los Angeles, when it rains, the runoff flows into the Los Angeles River, which carries it to the ocean. We need to rethink our water infrastructure so we keep every drop we get. Why not help low income communities find ways to capture water so they can use it where they need it most? And as we think about ways to create more sustainable communities, we need to think about jobs and who will do the work. At Strategic Concepts for Organizing and Policy Education (SCOPE), the organization I lead, we’ve tried this approach to help families cut their bills. For example, we’ve worked with partners who have trained people from the community to install solar panels, which have been placed in the homes of low-income families. Solar power can save California households more than $30,000 over 20 years. Something similar needs to happen with water. The 10-year anniversary of Hurricane Katrina and the ongoing drought in California shine a spotlight on the extreme weather we will continue to see as a result of climate change. 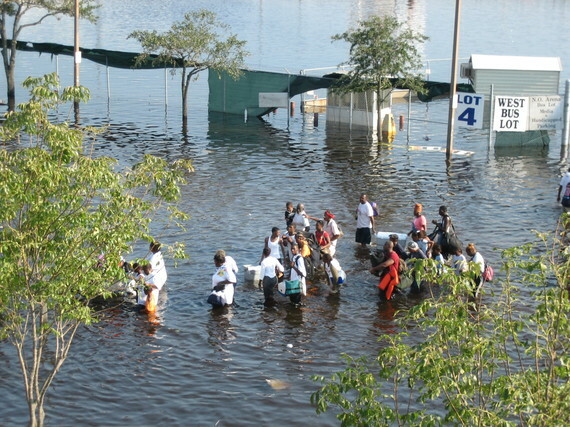 Americans often talk about Katrina and New Orleans as if they are synonymous, but the devastation was felt for hundreds of miles in communities where people have less resources to rebuild and rebound. This is a wake-up call that we must prepare those communities that are the most vulnerable, whether they are in Jackson, Mississippi, the Lower 9th Ward or South Los Angeles.